Written specifically for the woodworker seeking new adventures in the world of wood. Awaken your modern design aesthetic with 21 striking contemporary designs for the home. The fusion of nature's elegant shapes and modern architecture's bold symmetry yields a dynamic and engaging collection of designs for scroll saw woodworking. Your imagination will be captured by the bold lines sinuous curves and captivating shapes of these dynamic pieces. Patterns easy-to-understand instructions and step-by-step photography make crafting these projects attainable no matter your skill level. 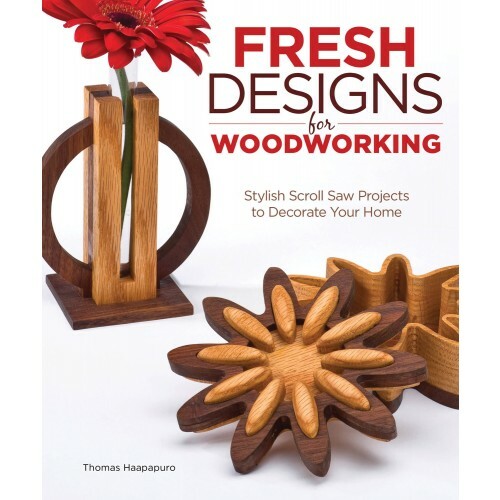 Perfect for beginners looking to progress their scroll saw abilities with interesting and compelling projects; learn the ropes of scroll sawing with seven step-by-step photo-illustrated instructional projects. Advanced woodworkers can master joinery 3D cutting and inlay with advanced projects such as Nesting Boxes the Zigzag Business Card Holder and the Flower Abstraction Wall Mirror. The chapter on designing your own patterns means you'll never again be without a project to create. Whether you're a beginner or an expert no woodworker's library is complete without this dynamic book. Each completed project is a conversation piece and you'll have a constant stream of visitors who won't be able to resist picking up these engaging works of art. Inside find everything you need to create these exciting and dynamic projects-New York City Wall Art Beautiful Branches Wall Art Cat-shaped Mantle Clock Retro Modern Wall Clock Radial Design Box Oak Leaf Box Flower bud vases Business card holders Picture frames And more!